Formal scientific proof for the "existence of UFO starships"
The formal scientific proof which documented that UFO space vehicles in fact do exist was published In 1982. Already over a quarter of century has passed (i.e. over 25 years) since the date of publishing this proof. But about the existence of it hardly anyone knows. Still the actual existence of UFOs is denied by the majority of scientists. Also still the official human science remains unaware that by ignoring investigations on UFOs it deprives itself the opportunity to develop the competence in researching intelligences other than human. This web page is to remind us, that such a "formal scientific proof for the existence of UFOs" in fact was developed, it still remains in power, and that we are obliged to consider it in our thinking and actions. The web page is also to illustrate the evidence and to explain the method utilised for proving that UFOs do exist. Furthermore, this web page is to realise that the research on intelligences other than human is for the Earth's science the basic requirement for growing out of the present juvenile status. Motto: "Independently what people say or do, truth always remains true." The main goal of this web page and the illustrations included into it, is to present the formal scientific proof for the existence of UFOs, and also to present various issues originate are connected with this proof. In 1980 I had the honour to invent and to develop in details the space vehicle with a magnetic propulsion system, called the Magnocraft. (The design, operation, attributes, specifications, and capabilities of the Magnocraft are described in details in volume 3 of monograph [1/5] - "Advanced Magnetic Propulsion Systems", and monograph [1/4] - "Advanced Magnetic Propulsion Systems". This space vehicle is also described quite well on several different web pages, e.g. on pages magnocraft.htm, oscillatory_chamber.htm, or propulsion.htm.) I developed the Magnocraft solely on the basis of my professional interests in propulsion systems, i.e. without any influence or inspiration from extraterrestrial UFOs. At the beginning of my developmental work I accepted, that the Magnocraft is just going to be a flying successor for an electric motor. This is what suggested to me the analogies and symmetries expressed in the so-called Cyclic Table. (This Cyclic Table is like a kind of the Periodic Table of the Elements. only that instead of chemical elements it is developed for propulsion systems. Thus on the basis of propulsion systems that are already invented, it allows to discover further propulsion systems which still await their inventors. This Table shown and described, amongst other, on the totaliztic web page propulsion.htm.) In this initial stage of the development of the Magnocraft, I was completely unaware of the similarities that exist between Magnocraft and UFOs. This similarity become obvious only when the complete design and attributes of the Magnocraft become deduced. Actually this similarities were pointed out to me only by readers of my articles, who claimed that they have actually seen the Magnocraft in operation with their own eyes - only they called it differently, i.e. "UFOs". Although at that stage I did not envisage any connection of my Magnocraft and UFOs, just in case there was one, I followed these claims of my readers and tried to identify the differences or similarities existing between both these vehicles. Soon afterwards, with the weight of the evidence that I collected, I realized that in fact there are unknown vehicles popularly called "UFOs" already operational on Earth, which display all the attributes that have been theoretically predicted for the Magnocraft. Subsequently the formal proof that "UFOs are already operational Magnocraft" has been worked out and published. The first version of this proof appeared in the article [1P] "Konstrukcja prosto z nieba" ("The design straight from heaven above") published in the Polish Journal "Przeglad Techniczny Innowacje", no 12/1981, pp.43-5. Unfortunately, in this first presentation of the discussed proof, the editor of the "Przeglad Techniczny Innowacje" would not publish drawings and photographs that were included to this article (similar to drawings and photographs that illustrate this web page). Someone clearly decided that the reinforcement of that publication with photographic evidence would be too convincing, and thus would destabilise the existing "status quo". Supposedly because of the lack of space, these photographs and drawings could not be also presented when the publication [1P] was then discussed in the article [2P] "Jak dowiedziono istnienia UFO" (i.e. "How the existence of UFOs was proven"), published in the Polish magazine "Kurier Polski", no 119/1981, page 5. Thus the complete version of this proof (together with a complete photographic and descriptive evidence) could be published only in New Zealand when I decided to publish it with my private funds - amongst others in monograph [1e] and in several other monographs that proceeded [1e]. (see the list of these monographs provided in subsection C10). The proof presented on this web page is only an updated extension, with additional evidence, of this original proof published in New Zealand in monograph [1e]. The most updated and extended version of the "formal scientific proof that UFOs do exist" is published in volume 13 of my newest monograph [1/5]. Because well illustrated and ready to print copies of that monograph [1/5] in PDF format are disseminated in internet completely free of charge, I am recommending to download one of these and review in it the full version of the proof discussed here. In last days of September 2010 the surprised world learned from television news and from articles in newspapers, that the United Nation (UN) opened a position of "ambassador for alien contacts". For example, in New Zealand still jocosely formulated message about opening this post appeared, amongst others, in the article "Take me to your scientist" from page A16 of newspaper The New Zealand Herald, issue dated on Tuesday, September 28, 2010. Someone may ask the question, "what is with this our science that the only thing it seems to be able to do about UFOs is to deny the existence of these alien spacecraft, while the life around us is full of evidence for the actual existence of these UFOs". The reply is simple - the human science is NOT able, as yet, to investigate anything that is intelligent, but that do NOT cooperate with scientists who research it. The science, of course, has research methods for investigating the so-called "inanimate nature". But these methods are based on a blind submission of objects of research, on the passive cooperation of these objects with scientists who research them, on the repetitiveness and predictiveness of behaviours of whatever is being researched, on susceptibility to tests, on the same behaviour in actual life and during experiments, etc., etc. On the other hand, intelligences other than human do NOT display any of these characteristics. For example UFOnauts in fact NOT only that refuse to cooperate with scientists who research them, but actually hide thoroughly from the entire humanity the existence of themselves and activities they carry out on the Earth. Furthermore, in the disposal of these other intelligences are technologies, devices, products, and phenomena, which our official science still does NOT understand and is NOT even able to guess their existence. Some amongst these other intelligences have also the ability to infiltrate the human science from inside, similarly like human spies and agents do this in matters of military intelligence or in order to carry out clever crimes. In turn after this infiltration is accomplished - they sabotage the human science from the inside. With all these problems the official human science is unable to coupe, is totally hopeless and incompetent towards them, and thus the only thing that is able to do, is to deny the existence of such intelligences other than human (most probably this denial is what such intelligences are actually after). The "official human science" can be classified to the category of so-called "intellects" (what are these "intellects", it is defined by the philosophy of totalizm). In turn every "intellect" matures due to passing through a whole range of phases in its development. The human science also passes through such phases. So if we compare the development of human science to the development of a human being, then the science already has passed through the phase "childhood". Presently it is in the phase "growing up", means showing up its "tempers" and behaving like a "arrogant teenager" who thinks that already knows everything. But the science is still very far from the maturity of an adult age. One amongst challenges that this science must undertake and be able to meet it in order to enter doors to the adulthood, is just to learn how to research intelligences other than human ones. Means how to research these intelligences which in fact do exist, but which refuse to cooperate with scientists who research them. About the bitter truth that the official human science is still incompetent in researching everything other than people that also have its own intelligence, certifies a number of facts. So let us have a closer look at most well known amongst such facts, explaining why these prove the incompetence and inability of the Earthly science to research intelligences other than human. 1. The authoritative denying by the human science that UFOs do exist and that UFOnauts are active on the Earth. The official human science persuades people that UFOs do NOT exist. But it is enough to have a look at newspapers or at Internet in order to realise how huge amount of highly consistent evidence continually comes out to the light and documents the actual existence of UFOs - for examples of such evidence see the web page evidence.htm - about evidence of the existence of UFOs and activities of UFOnauts on the Earth, aliens.htm - about scientific interpretation of photographs of UFOnauts, or explain.htm - about scientific interpretation of UFO photographs. Thus, this official denying of the existence of UFOs by the human science is just only a kind of "smoke screen" which is to hide the incompetence of our scientists in researching intelligences the level of which exceeds the level of intelligence in an average Earthly scientist. 2. The denying of the existence of God, while a wealth of scientific evidence is available, which conclusively confirms that God in fact does exist. In reality the human science continually stumble on the scientifically undeniable evidence for the existence of God. An entire wealth of such scientific evidence for the existence of God is presented in items #A2, #F1, #F2, and #F3 of the web page bible.htm - about authorisation of the Bible by God Herself. On the other hand, God is interested in allowing the human science to research Her. God even authorised for this purpose a kind of Her own "autobiography" called the "Bible". As it is explained on the web page will.htm - about the impact of "free will" at fate of the entire human civilisation, God actually is cooperating with human scientists who undertake research on Her. But in spite of this, the human science still feels too incompetent to undertake any research on God. In turn if the human science is incompetent in research of God who cooperates with humans, how much incompetent it must be in research on evil UFOnauts, who NOT only that refuse to cooperate with us, but also they sabotage the human science from the inside. 3. The denying by the human science that dolphins and whales have, and use, an advanced form of language. A scientifically controversial topic is the actual existence of the language with the use of which dolphins and whales communicate with each other. The human science denies that such a language does exist. But the existence of such a language is definitively confirmed for example by a case described more comprehensively in item #C2 (see 15 in there) of the web page evolution.htm - about origins of people, means where to look for a "missing link", which initially was published in the article "How Moko the friendly dolphin saved whales", from page A3 of the New Zealand newspaper "The Dominion Post", issue dated on Thursday, March 13, 2008. So if the human science is still incompetent in recognising the existence of a language in dolphins and whales, whom do NOT hide from people at all and whom even enthusiastically cooperate with human researchers, how this science has the courage to authoritatively claim anything regarding UFOnauts - who are known to be very hostile towards people. 4. The stubborn denying of the existence of a colossal carnivorous "squid" (called the "arkatutos") of around 14-meters long and weighting around 750 kg, in spite that about this squid informed us for centuries legends of New Zealand Maoris. For me personally such many years long denial by the official human science, that this colossal carnivorous squid in fact does exist, is the most convincing illustration for the incompetence of the science in researching intelligences other than human ones. After all, about the actual existence and aggressiveness of this colossal squid in waters of New Zealand, legends of local Maoris informed us for several centuries. Yet until 1999, when one such squid was accidentally caught in fishing nets, the official human science authoritatively denied that such a squid does exist at all. (Descriptions of this colossal squid are provided in item #C3 and in caption under "Fig. #I4" on the web page newzealand.htm - about mysteries and curiosities of New Zealand.) Surely, it is a habit of this carnivorous animal (which has some amount of animal intelligence) that it does NOT cooperate with scientists. Thus, if our official science was so hopeless and incompetent towards the animal intelligence of this "squid", that the science was unable to accept the existence of it, and to research this relatively primitive animal practically until the end of 20th century, how hopeless and incompetent this science must be towards the advanced intelligence and cunning behaviours of clever aliens who are hostile towards people but who still keep robbing our planet while hiding from us in their enormously advanced UFO vehicles. In order to accept the challenge that is thrown at the official human science by intelligences other than the human one, and show in this way the tendency to "grow up" to its maturity, the science must develop methods of researching these other intelligences that refuse to cooperate with scientists who try to research them. Such methods already do exist on the Earth, only that are used by human institutions that are other from the official science. For example, these methods are used in criminal investigations, in courts, in military intelligence, and also by hunters who hunt intelligent animals. The formal scientific proof for the existence of UFOs described on this web page was completed with the use of just such a method. It is called the "method of matching the attributes". Motto: "In the present situation, when we know perfectly well the design, operation, and specifications of the Earthly spaceship named the Magnocraft, the formal proving of the existence of UFO vehicles boils down to the proving that UFO manifestations in every aspect are identical to outcomes of the operation of this Magnocraft." The logical design of the proof presented here, is based on a proven in action and very reliable scientific methodology. It was also published in a range of articles and scientific monographs. As no one is able to disprove it, therefore the proof keeps its relevance and theoretically speaking every person on Earth is obliged to respect its existence and validity. In turn these people who ignore it, and refuse to acknowledge its consequences, are acting against the interests of humanity, behave like mannequins in hands of cosmic robbers from UFOs, and also with their actions they document that they allowed their minds to be completely manipulated by UFOnauts who secretly occupy the Earth. This item is to familiarise readers with details of this proof, and to make available to them the resource literature in case they wish to include this proof into their system of information, knowledge, philosophical principles, and manners of thinking. 1. Proposing the working thesis that "UFOs are already operational Magnocraft" and defining a way of proving the truth of this thesis. (This introductory item #B2 achieves this). 2. Identifying the Magnocrafts' attributes, to be subjected to "matching". Through applying the "Theory of the Magnocraft" outlined on a separate web page magnocraft.htm - descriptions of the "Theory of the Magnocraft", and also described comprehensively in chapter F from volume 3 of monograph [1/4] - "Advanced magnetic devices", 12 classes of the most representative attributes that characterize the operational Magnocrafts were theoretically identified and are used for the construction of the proof discussed here. All these 12 (and many further) classes of Magnocrafts' attributes are listed and explained in subsequent items of part #C of this web page. The reason why, in the proof presented here, only 12 attributes are used (instead of, for example, 13 or 24) is that from the probability point of view 12 attributes fully suffice for this purpose (see the justification provided in subsection P1 of monograph [1/4]). But the complexity of the Magnocrafts enables us to identify and describe a large number of further attributes not considered here (but partially discussed in subsection P2.13 from monograph [1/4]). Thus almost any required number of attributes of the Magnocraft may be included to this formal proof at a later date, if for some reasons this turns to be necessary or advisable. 3. Documenting the existence in UFOs of the corresponding 12 classes of attributes, out of which each one coincides exactly with the matching class of attributes deduced for the Magnocrafts. These corresponding 12 classes of attributes assigned to UFOs were revealed and documented due to analyzes of various UFO photographs, analyses of visual observations of these flying starship, and due to research on material evidence of UFO activities that are present on our planet. The full documentation of the existence in UFOs of these 12 classes of attributes observed empirically is presented in subsections from P2.1 to P2.12 in volume 13 of monograph [1/4]. In turn the presentation of just photographic evidence for these attributes is provided in part #C of this web page. 4. Matching each attribute of the Magnocrafts deduced theoretically, with the corresponding attribute observed empirically on UFOs. Because, as this is to be proven in the course of logical deductions from this web page, such matching provides a total correspondence (identity) of both groups of attributes, its conclusive outcome proves automatically the truth of the working thesis, thus constituting formal proof that "UFOs are already operational Magnocrafts". Practically this matching is carried out each time a given class of evidence is presented, means in subsections from P2.1 to P2.12 of monograph [1/4], and also in part #C of this web page. 5. Drawing the final conclusion from this process of proving, and explaining consequences of the proof discussed here. These conclusions are presented in subsection P2.15 of monograph [1/4], and also in item #C13 of this web page. The effort to keep the volume of this web page at reasonable level, caused that in the brief version of the proof discussed here for the existence of UFOs (provided in part #C below), the process of proving is mainly documented with the use of objective photographs (i.e. with the use of authentic photographs of UFOs, and also my own drawings that illustrate the operation of the Magnocraft). In order to save on the volume, I did NOT provide below such further kinds of evidence as: descriptions of eye sightings of UFOs, reports of people abducted on decks of UFOs, marks and material remains left by UFOs on the surface of the Earth, meetings with UFOnauts, etc., etc. (But these further categories of evidence are presented in the full version of the proof, provided in subsection P2 from volume 13 of monograph [1/4], and also on separate web pages of totalizm, e.g. on evidence.htm - about evidence of UFO activities on the Earth, explain.htm - about scientific interpretation of UFO photographs, military_magnocraft.htm - about military and destructive capabilities of UFO vehicles, or aliens.htm - about scientific interpretation of photographs of UFOnauts.) So if the reader wishes to learn also this further (also very wide) evidence, he or she should look at the full presentation of this proof provided in subsection P2 from volume 13 of monograph [1/4] - "Advanced magnetic devices". Various drawings and computer-generated illustrations of the subsequent types of discoidal Magnocraft are also available for viewing at my web page named magnocraft.htm. I encourage you to have a look at them. UFO vehicles never pose for photographs. Obtaining a clear photograph of these extraterrestrial vehicles always has an accidental character, that bases on a surprise and on a bit of someone's luck. This means that the biggest challenge of the proof carried out here, is to overcome the extreme difficulties and to obtain legible photographs of UFO vehicles. The situation is even worsen by the fact that there is a whole range of factors at work, which distort the objective picture of UFO vehicles (these distorting factors are discussed in subsection P2.1.1). However, in spite of all this, throughout the years a number of legible photos of UFOs have gradually been accumulated. If someone knowing the Magnocraft reviews these photographs, then it becomes immediately evident, that the shapes of discoidal UFOs correspond to the shape of the Magnocraft in every detail. Thus this correspondence of shapes of both vehicles is the first attribute that we are going to compare in the formal proof presented here. Fig. #C1a (left): A starship type K3 popularly known as a UFO vehicle. 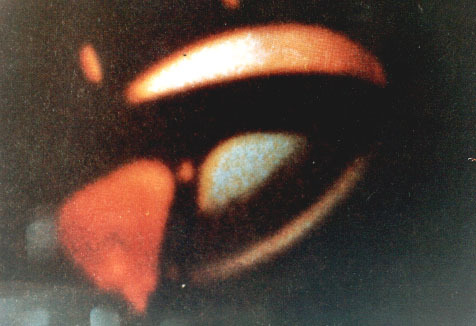 The UFO photograph shown here was selected from a sequence of four colour pictures taken by Augusto Arranda near Yungay, Peru, in March 1967 - see the book [1Fig.P1] and [2P2] by Ronald D. Story (editor): "The Encyclopedia of UFOs", New English Library, London 1980, ISBN 0-450-04118-2, page 39. 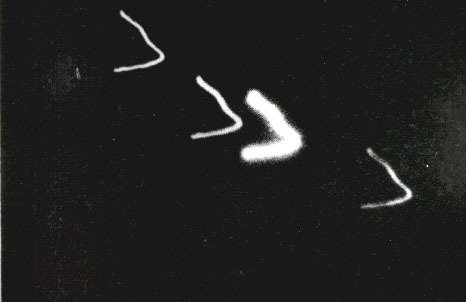 The entire sequence of Arranda photographs presents two UFOs type K3 captured in the various stages of their decoupling and flying in opposite directions (before these photographs were taken both vehicles flown coupled into a spherical flying complex shown e.g. in "Fig. #C2c"). Both vehicles fly in the throbbing mode of operation, thus their hulk and shape are clearly visible. The geometrical analysis shows the striking similarities of these K3 type UFOs to the Magnocraft type K3 - see the right part of this Figure. 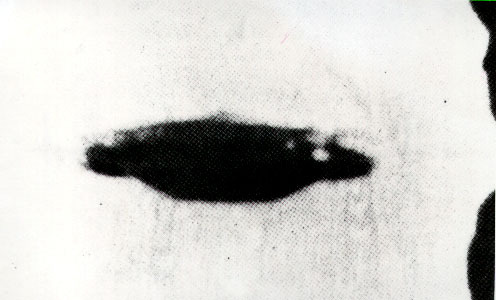 The outline of this UFO reminds us of an inverted saucer, the base of which is positioned perpendicular to the Earth's magnetic field force lines. In the centre of this vehicle the topside convex is clearly distinguishable (in the Magnocraft this central part it houses the crew cabin and the central propulsion compartment where the main propulsor is located). The UFO also possesses a lens shaped flange that fastens around the vehicle's base. In the Magnocraft type K3 this flange houses n=8 side propulsors. Fig. #C1b (right): The appearance of the smallest Magnocraft type K3 illustrated in the same position as the UFO from "Fig. C1a (left)". Please notice that the above illustration is also discussed on "Fig. #11ab" and "Fig. #12" from the totaliztic web page tapanui.htm and also on "Fig. #9ab" of the web page propulsion.htm, where the reader can learn further details about both vehicles illustrated here. It is confirmed on a huge body of evidence that UFOs are also able to create all the arrangements, which were theoretically deduced for the Magnocrafts and described in subsection F3 from volume 3 of monograph [1/4], while illustrated in "Fig. #5abcdef" from the web page propulsion.htm. 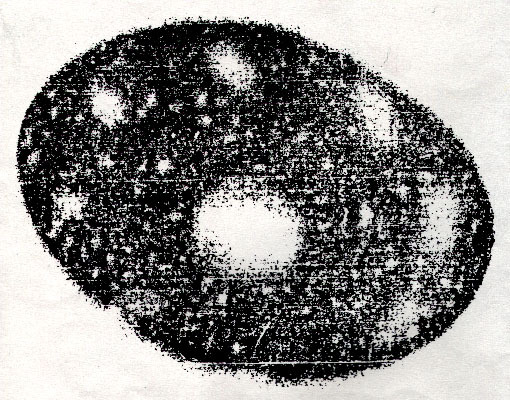 The most frequently observed arrangement of UFOs is the spherical flying complex - shown below in "Fig. #C2". In numerous photographs of such complexes not only both vehicles are visible, but also the double flange which fastens the complex around its central (horizontal) plane of symmetry can be distinguished - for the appearance of this flange see also "Fig. #C1abc" and "Fig. #K1abc" from the totaliztic web page evidence.htm (i.e. Figure P26 from monograph [1/4]). Fig. #C2a (left): The enlargement of the section from the photograph by Lars Thorn, showing the UFO vehicle hovering on the background of a landscape. (Please ntice that the entire Thorn's photograph can be viewed at "Fig. #D2a" from the totaliztic web page explain.htm.) On this enlargement the correctness of equation (F10) from [1/4] for the "K" coefficient can be verified. (For a spherical flying complexes this equation takes the form (F17): K=2D/H.) For UFOs and Magnocrafts type K6 this "K" coefficient takes the value of K=6. In the lower part of this drawing shown is a cut-away in the spherical complex of Magnocrafts type K3 that illustrates the theoretical principle of formation of such a complex. Shown are: the orientation of magnetic poles (N, S) in the main propulsor (M) and in subsequent side propulsors (U); mutual location of crew cabins (1, 2) of both vehicles; "onion charcoal" (C) which in special circumstances settles on the (N) outlet from the main propulsor; and the so-called "angel's hair" (A) which is a kind of jelly hydraulic substance (similar to white from eggs) positioned between both vehicles in order to neutralize forces of mutual attraction between their main propulsors. The onion charcoal pills from UFOs during landing. In turn angel's chair fall down after both vehicles separate from each other. The silky strands of angel's chair can frequently be spotted when they lie on fields or hang from trees before they have the time to evaporate. It is worth to notice that the above photograph and drawings are discussed comprehensively in caption under the illustration "Fig. 9a-d" from volume 13 of monograph [1/4], and also in subsection P2.2 of that monograph [1/4], where the reader can learn further details about vehicles illustrated above. In turn a spherical flying complex of Magnocrafts and UFOs is also discussed in "Fig. #D2" from the totaliztic web page explain.htm. There is a wealth of evidence available, which documents that in UFOs the propulsors are located in exactly the same place as in the Magnocrafts. Also the number "n" and the orientation of propulsors in UFOs are identical as in Magnocrafts. The first group of such evidence consists of photographs of UFOs in which the areas of glowing air indicate the location of propulsors. Perhaps the best known of these photographs is the one taken over Butterworth, Malaysia, and subsequently published in the 4th January 1979 edition of the newspaper "National Echo", Penang. 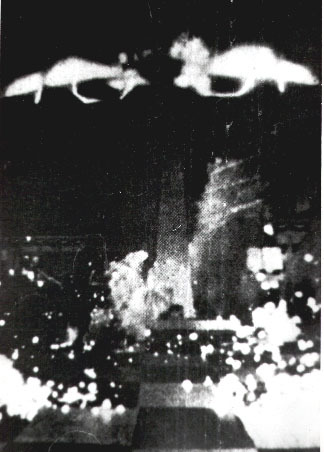 A copy of this photograph was presented in the MUFON UFO Journal, February 1980 issue, page 8. This photograph is shown in "Fig. #C3" below (while originally it was shown in Figure P15 from monograph [1/4]). A similar photograph, only that capturing a UFO of a slightly different type from a side view (not from below), was also taken in New Zealand above a small fishing village called Motunau Beach (click on this (green) writing in order to see the UFO photograph from Motunau Beach). Fig. #C3a (left): A UFO type K3 photographed from beneath while hovering over Butterworth, Malaysia, on 3 January, 1979. 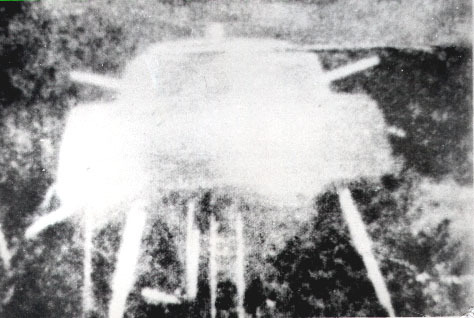 The above photograph was published in the January 4 1979 edition of the "National Echo", Penang, Malaysia, and subsequently reproduced in the February 1980 issue of the "Mufon UFO Journal", page 8. The original copy of this photograph turned out to be impossible for getting hold of, thus I am showing here only its newspaper copy. It shows the glowing areas appearing at outlets from the vehicle's propulsors. (Although the lowest of these propulsors did NOT ionise the air at the moment of taking this photograph, but that it does exist in this UFO it is indicated by an empty space which it occupied.) The photograph allows us to determine the location (and number "n") of these propulsors in the vehicle's shell. The mutual orientation of the propulsors (the main one is placed in the centre of the UFO and is surrounded by n=8 side propulsors), also their number and positioning in relation to the edges of the shell, correspond exactly to the details of the K3 type of Magnocraft shown in part "b". It is worth to mention that there is a significant number of similar photographs which also show UFO propulsors taken from different angles and ion different modes of operation (e.g. at the moment of taking them the air is ionised only under some of these propulsors) - click on this (green) writing in order to see an example of such photograph taken in New Zealand in Mutunau Beach. Fig. #C3b (right): A drawing of the Magnocraft type K3 seen from underneath. It shows the location of vehicle's propulsors during special atmospheric conditions (i.e. evening, low light, moist air). The location of propulsors is then disclosed by the glow of the air ionised by a powerful magnetic field at outlets from these propulsors. When the light is subdued these layers should be visible even with the naked eyes. Blackened areas (marked U, V, W, X) indicate the outlets of the side magnetic propulsors. When the Magnocraft flies in the Southern Hemisphere, the side propulsors should emit a reddish-yellow light because their North (N) magnetic poles are oriented downwards. Crossed lines show the outlet of the main propulsor (marked M), which in the Southern Hemisphere should emit a blue green light because its South (S) magnetic pole points downwards. Note that these colours are reversed (i.e. a reddish yellow replaces a blue green and vice verse) when the Magnocraft flies in the inverted position or changes hemispheres. Also, when viewed from overhead, the outlets of the same propulsors have colours which are the reverse of those seen from below. It is worth to notice that a photograph of a UFO similar to the above one, only that taken at night, is also presented in "Fig. #C3a" from the totaliztic web page explain.htm. UFOs, similarly as Magnocraft do, utilize the principles of magnetic attraction and repulsion for producing the propelling forces. Such use of forces of magnetic interactions by the propulsion system of UFOs, induces a number of manifestations, which are now able to be clearly identified. The most important of these manifestations is the formation of magnetic circuits. The presence of these circuits in UFOs can be revealed on photographs. Amongst numerous photographs showing these magnetic circuits, the most evidential is the one taken by Enrique Hausmann over Mallorka, Spain. It is shown in "Fig. #C4b" (originally in Figure P19 (D) from monograph [1/4]). It presents the octagonal outlet from the main propulsor of a K6 type UFO, from which spreads five spirals of the spinning field's strands. These strands are formed from the force lines of the UFO's main magnetic circuits - see the photograph from "Fig. #C4c. Similar spiral strands of force lines, which ionise particles of gas, are also captured on the NASA photograph of a UFO shown in Figure P29 from monograph [1/4]. 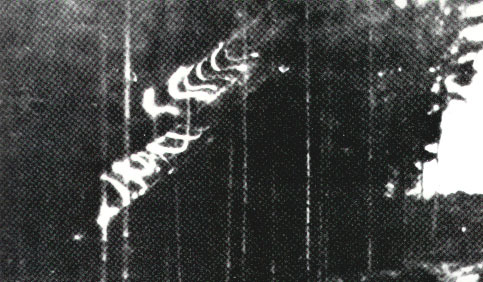 The Hausmann's photograph shows the UFO's magnetic circuits in an overhead view. There are other pictures also available, which show the magnetic circuits of UFOs in a different views. Their best example is the photograph from "Fig. #C4a" - and compare it with the upper part of "Fig. #C4c". Fig. 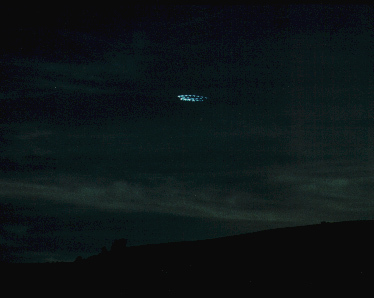 #C4a (left): A night time photograph of two UFOs type K6 coupled into a "flying cluster". It was published in the Journal [5P2] "UFO Sightings" (S.J. Publications, Inc., 1141 Broadway, New York, N.Y. 10001, USA), January 1981 edition, page 15. This photo is the best presentation known to the author of the magnetic circuits of a UFO shown from the side view that is also illustrated in the upper part of "Fig. #C4c". It definitely confirms that the strands of magnetic field force lines join the outlet from the vehicle's main propulsor with the outlets from side propulsors. The course of these magnetic circuits is visible because they ionise the air with their powerful magnetic field, which (the ionised air) glows within the volume of these magnetic circuits. Fig. #C4b (middle): The photograph of the central section in a UFO type K6 flying in the "magnetic whirl" mode of operation. It was taken by Enrique Hausmann over Mallorka (Palma Island), Spain, on 24 April 1950 - see the book [1P2] by Adolf Schneider and Hubert Malthaner: "Das Geheimnis der unbeakannten Flugobjekte", Hermann Bauer Verlag KG Freiburg im Breisgau, West Germany, 1976, ISBN 3 7626 0197 6, page 218. The UFO travelled from east to west, appeared to rotate, and produced a loud buzzing sound. The photograph captures, from below, an outlet of the vehicle's main propulsor of the second generation (i.e. shaped into an octagon - see also "Fig. C3b" and "Fig. C8(2i)" in monograph [1/4]). Five strands of spinning force lines of the main "magnetic circuits" are spiralling radial from this outlet. At the edges of the photograph, each one of these five strands splits into three separate streams of the field's force lines. Notice that each middle stream engages more energy from the field than the two side streams. This results from the sinusoidal distribution of the outputs from the vehicle's side propulsors (to see why compare the above photograph with Figure F25 (c) and with the description from subsection F7.2 of monograph [1/4]). Fig. #C4c (right): In the upper part the Magnocraft type K6 (i.e. for which K=D/H=6) is shown in a side view. It illustrates the side appearance of its whirling magnetic circuits. The polarity N, S of its propulsors is indicated. All three "magnetic circuits" are present and shown in one of their many possible positions. The location of the field's strands reflects the situation shown in the lower part (B) of the same diagram. In the lower part of this diagram shown are whirling magnetic circuits of the Magnocraft type K6 in an overhead view. By a broken line marked is the section of the vehicle which was captured on the photograph from part "#C4b" of this illustration. Notice that the thickness of the successive strands of the field has a sinusoidal distribution. For example, if the side propulsors "V" (with the "blackened" outlet) have their maximal output, the propulsors next to them (i.e. "U" and "W" - with "dotted" outlets) are in the mean value of their output, whereas propulsors "X" (with "unmarked" outlets) produce no output at all, while propulsors next to them repeats such a sinusoidal output cycle, etc. This sinusoidal distribution of the magnetic field reflected in the thickness of strands that link the main propulsor with side propulsors, is caused by the 90 degrees phase shift in pulsations of subsequent side propulsors. Spirals formed by such whirling strands of magnetic field that change their thickness sinusoidal, are similar to shapes of streams of water spread by a spinning garden sprinkler. UFOs not only utilise a strong magnetic field for producing lifting and stabilization forces, but this field also pulsates similarly to the one produced by the propulsors of the Magnocrafts. The best photographic confirmation of the pulsating character of the magnetic output from UFOs, is provided by the night time pictures that reveal the multiple images of these vehicles - see "Fig. #C5a". The principles used for the obtaining of such multiple images are explained for Magnocrafts in "Fig. #C5b". Fig. #C5a (left): A photograph of very fast moving UFO, taken by Ken Chamberlain over the southwest part of the freeway called "the outerbelt" that encircles Columbus, Ohio, USA, near a small town called Grove City, about 10 p.m. on 17 October 1973. (Description of this photograph can be found in the earlier referred book [1P2] page 205, while originally the photograph was published on the front page of "The Columbus Dispatch", issue dated on 18 October 1973.) This photograph shows a row of flashes identical to these that are explained below for part "b" of this "Fig. #C5". Please notice that there is a huge number of night photographs of UFOs, which all document similar flashes of "magnetic circuits" of these UFOs. Only that on these other photographs UFO vehicles flew with a different orientation and in a different direction. Thus towards the photographer were directed different sections of their "magnetic circuits - which produced on films shapes that are different from the shape explained in the drawing from "Fig. #C5b" on the right side. For these further examples of such flashes see photographs which in my monograph [1/4] were shown in Figure P18(3) (click on this (green) writing in order to see this photograph of flashing magnetic circuits of a UFO), or on Figure P18(4) (click on this (green) writing in order to see this photograph of flashing magnetic circuits of a UFO). (a) Outline of the Magnocraft (or a UFO) with an indication of the layer of glowing air which flashes when being ionized along a side "magnetic circuit" (i.e. along the path of magnetic field force lines which join the opposite outlets of the same side propulsor). Because this layer of the air "flashes" in rhythm of pulsations of the magnetic field yield to the environment by a given side propulsor, while each "flash" lasts just a short moment of time, the fast motion of the vehicle leaves a chain of such flashes spread along the trajectory this vehicle follows. Symbols appearing on this part of the drawing: V - speed vector, T - period of pulsation of the magnetic flux (F) generated by side propulsors of this vehicle, t - time. (b) An illustration which documents what would contain a photograph of this spacecraft taken at night. Only the flashes from the air ionized by the magnetic circuit of a side propulsor are visible in darkness. The spreading of these flashes indicates the movement of the propulsor during the time of film exposure. (c) A curve F=f(t) of a variation in time (t) of the magnetic flux (F) produced by the side propulsor of the Magnocraft. This variation corresponds to the "beat type curve" that is formed in the result of mutual subtraction of two sinusoidal curves (for more comprehensive description of principles and reasons of this subtraction see the operation of so-called "twin-chamber capsule" formed from Oscillatory Chambers of Magnocraft's propulsors - presented in subsection C7.1 and in Figure C7 of my monograph [1/4]). Such a "beat-type curve" is composed from a straight line (i.e. the constant magnetic flux of the value "Fo"), onto which every period "T" is superimposed a short "pulse" of the amplitude ΔF. The magnetic field whose intensity pulsates according to such a "beat-type curve" ionizes the air only when its value goes through a next "peak". Therefore layers of air ionized by a vehicle's magnetic circuits must appear as a chain of individual flashes visible in part (a) of this drawing (instead of a continuous glow). Similarly as Magnocraft do, also UFOs form numerous magnetic circuits. The documentary value of these circuits depends on their forming into loops that close through clearance of subsequent propulsors of these vehicles. Only in case when UFOs use a purely magnetic propulsion system, identical to the propulsion system of the Magnocrafts, they are going to form magnetic circuits. In case of any other propulsion system, such circuits would not be formed, while the possible distribution of a field around the vehicle would be completely different than such a distribution around the Magnocrafts. The best documentation of the existence of magnetic circuits in UFOs, are photographs which capture these circuits. There are numerous photographs which show such circuits in UFOs. Their most spectacular examples illustrate this item #C4. They are shown in "Fig. #C4abc". The existence of magnetic circuits in UFOs is also excellently documented on landings of these vehicles in crops. As this is explained e.g. in subsection F11 from monograph [1/4], the so-called "crop circles" and "pictograms" found in crop fields of England, in fact are marks formed through pushing down of crops by force lines of concentrated magnetic field from these magnetic circuits. Therefore "Fig. #C6ab" below is another confirmation for the existence of magnetic circuits in UFOs. Fig. #C6a (left): A photograph of a "crop circle" formed by a flying cluster of UFOs type K6. The above circles, having a total length of almost 50 meters, were photographed in 1990 at Longwood Estate, Southern England. It is worth noticing that the circles shown here include all the elements explained in the right illustration (i.e. "Fig. #C6b"). 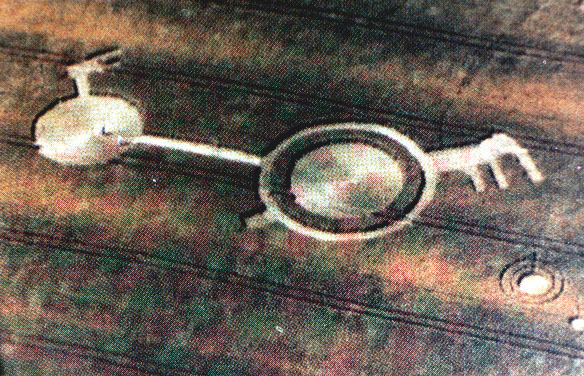 The only difference is that this crop circle has two "tail" marks formed by the circuit of rotary stabilization (Ts) which in UFOs fulfils the same function as the "tail" propellers in present helicopters - these marks are located by both units positioned almost perpendicularly to the main axis of the landing. Furthermore, this UFO landing does NOT have marks from the "tuning" circuits (marked "3" in the right "Fig. #C6b") - means that the "depth" of this landing was higher from the span of these tuning circuits "3". Fig. #C6b (right): An example of a smallest "flying cluster", which simultaneously represents a basic link in every larger flying cluster. Illustrated is one of the simplest cases of the linear clustering together of two spherical complexes type K6. The main advantages of the resultant configuration include: ability to couple together the Magnocraft (or UFOs) of any possible arrangements and types (not only spherical complexes shown here), preserving the original configurations of vehicles that form the cluster, and flying the whole cluster with only one pilot. A flying cluster is obtained through the magnetic bonding of a number of independent vehicles which do not touch one another. Such bonding without physical contact is obtained by the formation of two opposite types of magnetic circuits: i.e. those that repel coupled vehicles (see circuits labelled (2) that are shown with a broken line) and those that simultaneously attract the vehicles (i.e. circuits (3) to (6)). The function of the links for these circuits is performed by "unstable units", i.e. vehicles whose propulsors produce only lifting and attraction forces (i.e. no stabilization forces) - see the complex on the right. Note that any other vehicles or arrangements can be attached in addition to the above cluster, with the condition that between every two stable units an unstable unit is placed to link them together. In the upper part (a) of this drawing, a side appearance of a simplest linear cluster is shown. Illustrated are: the polarization of propulsors (N, S) in the coupled vehicles characteristic for the Northern Hemisphere; examples of magnetic circuits that provide each class of interactions required between both vehicles (i.e. separating (2), holding (4) to (6), tuning (3), and compensating (Ts)); and the penetration of the ground (G-G) by these circuits (this penetration causes the formation of very distinctive landing marks shown in part (b) from the lower part of the same drawing). Note that to keep this illustration simple it has not been shown that every side propulsor of the unstable unit is either linked with the main propulsor of the stable unit by a holding circuit (see (6)) or is involved in a tuning circuit. In the lower part (b) an overhead view of a distinctive landing site which such a linear cluster produces if it hovers at a low height with the magnetic whirl mode of operation is illustrated. The labels link each characteristic element of this site with the appropriate class of magnetic circuits that produces this element. Note that a change in the height of the vehicles must result in a slight alteration of the site's shape and main features. It is worth to notice that still another photographs of UFO landing sites in crops that were created in a manner similar to that illustrated above, are shown also in "Fig. #D8c" and "Fig. #D8d" from the totaliztic web page explain.htm. There are also numerous photographs available, which prove that UFOs form a magnetic whirl identical to the one produced by the Magnocrafts. An excellent example of such a whirl was already presented in "Fig. #C4b". The different photographs, which provide another type of evidence for the existence of these magnetic whirls in UFOs, are the so called "ionic pictures of a whirl" - see "Fig. #C7" shown below. In such pictures of UFOs whirls, all the elements inferred theoretically for the whirl of the Magnocraft are present (compare Figure P20 to Figure F27 in monograph [1/4]). They include, amongst others: a block of the main swirling, a pillar of central swirling, upper and lower slipping points, etc. Notice that the correlating sizes of these elements depend on the type of UFO which created them and also on the manoeuvre that this UFO was actually performing. Fig. #C7a (left): A night time photograph of a landed UFO type K4 taken by an anonymous photographer in Genui, Italy, on 23 June 1963 - see page 184 in the book that in subsection P2.16 of monograph [1/4] is referred under the number [1P2]. For the first time the above photograph was published in the Journal "Domenica del Corriere", 8 September 1963. The above photograph perfectly illustrates the "ionic picture of the UFO's magnetic whirl" and its similarities to the Magnocrafts' "ionic picture of the magnetic whirl". Shown are all the elements characteristic for such an ionic picture of a whirl. The photograph also illustrates the three telescopic legs extended to support the landed vehicle, a ladder, and a set of periscopes allowing for the visual observation of the environment. Notice that the legs are located at an angle slanted towards the vehicle's base. Fig. #C7b (right): An example of the "ionic picture of a whirl". 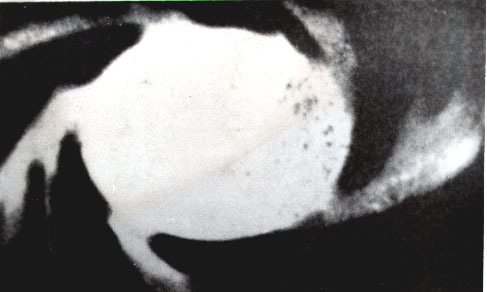 This picture represents the apparent shape of the magnetic whirl surrounding an operational Magnocraft or UFO (illustrated above is a whirl formed by a motionless single Magnocraft type K3). The visible part of the ionic picture is formed from particles of ionized air (whose spin follows the rotation of force lines of the magnetic field around the central axis of the spacecraft). The outline of the vehicle is indicated by a broken line. Continuous lines illustrate the path of the three types of magnetic circuits formed from the output of the Magnocraft's (or UFO's) propulsors, i.e. C - central circuit looping through the main propulsor only; M - main circuits passing through the main and side propulsors; and S - side circuits looping through the side propulsors only. The force lines of these circuits are kept spinning permanently. 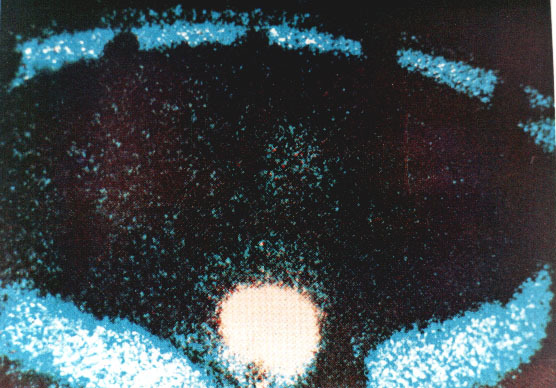 The blackened areas indicate the shape which appears to an eye witness. The characteristic features of this shape are: 1 - the "upper slip point" of the central pillar; 2 - the pillar of central swirling; 3 - the block of main swirling; 4 - the flange of side swirling; 5 - the bulges of the lower part of the main swirling; 6 - the "lower slip point" usually concealed behind the main swirling and side swirling. Note that the motion of the Magnocraft (or UFO) may change (disperse) the visible shape of the magnetic whirl presented here. Manoeuvres of the Magnocraft (or UFO), or more strictly the change of proportion between output from the main propulsor and outputs from side propulsors, may also cause a distortion of the picture shown here. It is worth to notice that photographs similar to the above one, that show in colours the "ionic pictures of a whirl", is presented also in "Fig. #C5" and "Fig. #C7" from the totaliztic web page explain.htm. The ability of UFOs to induce electric currents is confirmed by the numerous side effects accompanying the appearance of these vehicles. Some of these effects have been discussed earlier, e.g. consider an inductive shield and the plasma whirl (see "Fig. #C7ab"). But there are also effects which directly involve the accumulation of electric charges. An example of these can be the electrical charging of non conductive materials, e.g. hair or clothing. Below is a description of the sighting that took place along Route 133 near Sagamore Hill, Ipswich, in the north east corner of Massachusetts, USA, on September 3, 1965 - see [4P2] page 143. "As his car approached the crest of the hill overlooking Candlewood Golf Course, Dennis felt the hairs rise on the back of his neck. As he reached the top of the hill and started down the other side, a feeling like static electricity coursed through his body. Simultaneously he was startled by a strange glow just off the road to his left. Moments later he was almost broadside to it. He noticed an object like an inverted saucer with a flat dome floating nearby. Surrounded by a weird grayish glow with a reddish tint, it seemed about 12 meters in diameter. Dennis continued his driving. He wanted no part of it." Further numerous examples of inducing electric currents by propulsion system of UFOs can be found in an extensive literature on UFO subjects. This include hair standing on ends - see "Fig. #C8ab" below, electrifying of the air - see descriptions from subsection U3.8 of monograph [1/4], and many further phenomena. Fig. #C8a (left): A UFOnaut calling himself "Ausso". This illustration presents Carl Higdon's recollection of the alien called "Ausso" who abducted him from the northern edge of the Medicine Bow National Forest (south of Rawlings), Wyoming, USA, on 25 October 1974. It is published in the book [3R1] by Joshua Strickland, "There are aliens on earth! Encounters", ISBN 0 448 15078 6, page 16. The alien was about 1.88 meters tall and weighed approximately 82 kilograms. He wore black shoes and was clad in a black, tight fitting overall that resembled a diver's wet suit, clasped by a heavy belt with a shining yellow six pointed star and an emblem below the star. "Ausso" was bow legged with a slanted head, no chin, and one long appendage in place of each hand. His hair was thin and stood straight up on his head. I believe that it was because his hair was electrified by the main propulsors in his epaulettes. This is because descriptions of that case suggest that he actually used the design of his personal propulsion system which utilised main propulsors located in epaulettes. From the explanations by the Theory of the Magnocraft, "Ausso" wore a version of the personal propulsion garment with the main propulsors located in the epaulettes (note the reinforcing braces joining the belt with the epaulettes, and dark clouds of ionised air hovering just above his epaulettes). At the ends of his arms (i.e. in the appendages) additional enhancement propulsors were located (for aiding heavy physical work) - see Figure E4 "a" in monograph [1/4]. From the description available it can be deduced that these enhancement propulsors utilized a technological version of telekinesis. Fig. #C8b (right): The version of "personal propulsion" with the main propulsors assembled in the epaulettes. Shown are: (1) one of the two main propulsors; (2) the eight segment belt housing the side propulsors; (3) one of the two bracelets placed on the joints of the wrists. These bracelets contain the additional enhancement propulsors (not used for flights) which multiply the user's physical strength when he or she performs heavy work. The drawing also illustrates a hood for the head - which is just to shield the hair of the user from the electrifying, and also bat-wings like pelerine sawed to the suit along the spine cord and back of sleeves - which aerodynamically increases the smoothness of flights (like a present day handglider). How such pelerines of UFOnauts do look like after they are spread for flights, it is revealed in "Fig. #4" from the web page sw_andrzej_bobola_uk.htm. Note that to strengthen the reliability and steadiness of this garment, sometimes two crossed braces (suspenders) can additionally join the belt with the epaulettes - visible in part "a" of the above illustration. It is worth to notice that photographs of UFOnauts (but without hair standing on ends), are published also in "Fig. #H2a" and "Fig. #H4a" from the totaliztic web page explain.htm, in "Fig. 1" to "Fig. 9" from the totaliztic web page aliens.htm, and in "Fig. #4" to "Fot. #6" from the totaliztic web page sw_andrzej_bobola_uk.htm. There is vast body of evidence already available, which confirms that UFOs can operate in three different modes of operation in which the Magnocrafts are going to operate, namely in modes: (1) "throbbing", (2) "magnetic whirl", and (3) "magnetic lens". In each mode, the properties of UFOs correspond exactly to those of the Magnocraft when it operates in the same mode. (For details of these three modes of operation of the Magnocraft - see the descriptions from subsection F10 in monograph [1/4]). 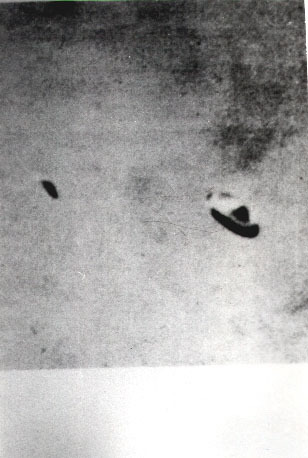 The photographic evidence documenting the operation of UFOs in a particular mode can be classified into two categories, depending on whether the particular picture was taken during daylight or at night. In the daytime photographs of UFOs operating in the "throbbing" mode, the shapes and outlines of these vehicles are very clearly shown - see "Fig. #C1a" or "Fig. #C2a". But the daytime photographs of UFOs operating in the magnetic whirl mode reveal only various shapes of the "ionic picture of a magnetic whirl", behind which the real outlines of these vehicles are hidden - similar to the picture visible in "Fig. #C7a". With night time photography, the appearance of UFOs changes drastically and the only visible forms become the areas where the ionized air emits a registerable glow. Thus, when UFOs operate in the "magnetic whirl" mode, photographs taken with a long time of exposure show only a cloud of ionised and glowing air spinning around these spacecraft - "Fig. #C4a" and "Fig. #C12". In turn photographs taken with a short time of exposure show only the spinning magnetic circuits - see "Fig. #C4b". In turn photographs of motionless, "throbbing" UFOs taken with a delayed time exposure show only the single glowing outlet from the main propulsor located in the centre of the vehicle and a ring of glowing outlets from the side propulsors located along the flange - see "Fig. #C11". The "magnetic whirl" of UFO vehicles and Magnocrafts is also a source of several further effects, for example the so-called "inductive shield", and so-called "plasma saw". In turn these further effects give to UFO vehicles and to Magnocrafts rather extraordinary capabilities. 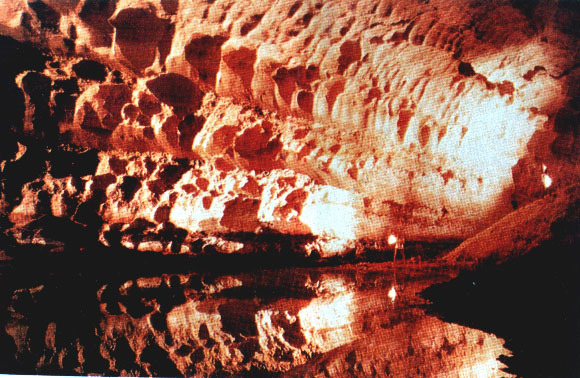 For example the "plasma saw" allows to drill in rocks unique kind of long, glossy UFO tunnels, one example of which is shown below in "Fig. #C9a". Fig. #C9a (left): The Cocklebiddy Cave on the Nullarbor Plain in Western Australia. So far about 6 kilometers of this straight, elliptical tunnel, directed exactly south-north, have been investigated. Colour photographs are published in [2FigO6] the Australian magazine People (Weekly illustrated Magazine, 54 Park Street, Sydney, NSW 2001, Australia), December 5, 1983, pages 8 to 10. Notice the cross-running grooves on walls of this tunnel, which look as if the tunnel was made by a huge drill. This particular cave has the shape of a round tunnel that corresponds exactly to the evaporation of the native rock by the floor of a disk-shaped UFO. (a) Principle of evaporation of tunnels. It shows the penetration of the native rock by a "plasma saw" of the Magnocraft (or UFO) which changed the direction of flight from the initial south to north, into the final illustrated here from an east to west. Symbols: 1 - the Magnocraft (or UFO) whose magnetic field spins and thus produces a whirling plasma saw, 2 - the spinning disk of the plasma saw which cuts into the rock and evaporates the tunnel, 3 - vapours of the rock that expand along the tunnel already evaporated, 4 - rock rubble that fell on the bottom of the tunnel behind the vehicle. (b) The breach from the tunnel. Such a breach is a crack in the native rock caused by the pressure of compressed gasses that expand towards the surface of the ground. It can later be used as an additional entrance to the tunnel. Symbols: 5 - the spewing of the rock vapours that forms a kind of miniature volcano at the breach outlet (the presence of this vapour discloses the location of the breach, 6 - the breach canal formed by the compressed vapours expanding to the surface of the ground. (c) An elliptical tunnel left by the Magnocraft (or UFO) that flew in a north south or south-north direction. Such a tunnel has an elliptical cross-section because its shape reflects the circular shape of the vehicle that flies with the base perpendicular to the environmental magnetic field - see also parts (b) and (d) of Figure O6 from monograph [1/4]. Symbols: 7 - glossy walls and ceiling of the tunnel (the close-up of their surface must show hardened rock bubbles), 8 - the aerodynamic, although rough and craggy "apparent floor" of the tunnel, that represents the upper surface of the "rock bridge" (in horizontal tunnels this floor is flat and relatively even and dry, while in tunnels running under angle it has a shape of hardened "dunes" and "bridges" through which flows water), 9 - a "rock bridge" formed from hardened particles of native rock which bury the lower part of the tunnel (this bridge lies on the rock rubble), 10 - rock rubble that fills up the lower half of the tunnel and covers the "real floor" of the tunnel, 11 - water that accumulates in gaps between rock rubble and that forms a stream which flows under an apparent floor of the tunnel, 12 - the "real floor" of the tunnel along which water flows, 13 - the range of magnetic, thermal, and crystallographic changes in the native rock, caused by the action on this rock of plasma and field of the vehicle. (d) A triangular tunnel formed by the Magnocraft (or UFO) flying in an east west or west-east direction. This shape results from reflecting in the rock the side outlines of the vehicle that evaporates this tunnel - see also part (a) of Figure O6 in monograph [1/4]. Symbols: I - the angle of the vehicle's inclination reflecting the course of the force lines of the Earth's magnetic field and thus also the slanting of triangular tunnels or the degree of flattening of elliptical tunnels (or more strictly the ratio of the horizontal to the vertical axis). Symbols 7 to 13 have meaning explained in part (c) of this Figure. The above can be complemented with the information, that photographs of several further underground tunnels evaporated in the rock by UFOs, are also published in "Fig. #F1" and "Fig. #F3" from the totaliztic web page newzealand.htm, in "Fig. O6" from the totaliztic web page magnocraft.htm, in "Fig. #3" from the totaliztic web page day26.htm, and in "Fig. #11" from the totaliztic web page korea.htm. Observations of UFOs reveal that these extraterrestrial vehicles also cause all types of interference with electromagnetic radiation, which is characteristic for the Magnocrafts' propulsion. The three basic types of this interference include: (1) TV, radio, radar, and radio telephone disturbances, (2) the so called "black bars", and (3) the "magnetic lens" - see their descriptions from item #10 in subsection F13 of monograph [1/4]. The strong correlation between the disturbances in telecommunications (especially in TV reception) and close range sightings of UFOs are often reported. A summary of such electromagnetic disturbances, as well as the descriptions of individual cases, can be found in many UFO books - e.g. see books referred to in subsection P2.16 of monograph [1/4] under numbers [2P2] page 111, or [4P2] page 47. This type of disturbances are also frequently experienced by people flatting with ovule donors, although many of them qualifies them as "natural phenomena" and forget fast. Columns of a strong magnetic field from propulsors of UFOs frequently form the so-called "black bars" envisaged for the Magnocraft s - see their description in subsection F10.4 from monograph [1/4]. The evidence for these black bars in UFOs is illustrated below in "Fig. #C10", while their extensive discussion is provided in subsection S1.1 from monograph [1/4]. Fig. #C10a (left): The diagram of a "spool-shaped" UFO presented in the book which in monograph [1/4] is referred under the number [5S1.1], page 11. It illustrates a witness's recollection of the spaceship which on May 9, 1969 abducted a soldier named Jose Antonio da Silva from Victoria, Brazil. He was found 4 days later in Bebedouro, 800 kilometres away. It is worth to notice, that in spite this UFO vehicle was recreated "from the memory" of the witness, still it reflects relatively well the most vital components and the general appearance of it. From the point of view of the "Theory of the Magnocraft", the illustrated spaceship represents the semi attached configuration shown on the right in part (b) of the above Figure. Because the "black bars" formed from the field of this UFO in fact have square cross-section, thus their outlines documented with this illustration provide further evidence that UFOs really use "Oscillatory Chambers" for the magnetic field generation. Fig. #C10b (right): One amongst two possible principles of the formation of a so-called "semi-attached configuration" obtained through coupling together by their topside domes two vehicles type K3, mutually facing each other - see also class #2 in Figure F6 in monograph [1/4] (this Figure F6 is also shown as "Fig. #5" on the web page propulsion.htm). The "Theory of the Magnocraft" reveals that in the principle of forming such a configuration illustrated here, between the main propulsor of the lower spacecraft and the side propulsors of the upper vehicle there must appear columns of a highly concentrated magnetic field that traps light and therefore are visible as "black bars". These "black bars" are intentionally shown on the sides of vehicle illustrated above - they give to the configuration the appearance of an "asymmetrical spool". The cross section of these "black bars" must reflect the shape of the devices used to generate the magnetic field in the propulsors of these vehicles, i.e. if Oscillatory Chambers of the first generation are used for this purpose, the cross-section of the columns must be a square. Independently from the shown above principle of the formation of a "semi-attached configuration" of Magnocrafts, a similar configuration can also be obtained when all propulsors in both couples vehicles have the same magnetic pole directed in the same directions. In this case the "black bars", if appaer, link outlets from side propulsors of both vehicles - thus the entire configuration looks like a "symmetrical spool". This second principle of the formation of "semi-attached configuration" of Magnocrafts is shown in "Fig. #5b" from the web page memorial.htm - about ways UFOnauts undermine the evidential value of authentictic photographs of UFOs. It should be added here that effects of the operation of completely different interference of the magnetic field of UFOs with the electromagnetic radiation, depending on the formation of so-called "magnetic lens", is shown and discussed on "Fig. #C9" from the totaliztic web page explain.htm, and on "Fig. 6a" from the totaliztic web page memorial.htm. According to the "Theory of the Magnocraft", in the "throbbing mode of operation" of magnetic propulsors, the outlet from each opposite pole of this propulsors must glow in a different colour. At the north magnetic pole "N" (i.e. at the "inlet" of the magnetic field "I") the air glows in a yellow-orange colour. In turn at the south magnetic pole "S" (i.e. at the "outlet" of the magnetic field "O") of the propulsor the air glows in a blue-green colour. (Notice the different than in Physics notation of magnetic poles, described in subsection F5.2 from volume 3 of monograph [1/4]) On all colour photographs of glowing UFOs such visibility of different colours of air glow at outlets from vehicle's propulsors working in the "throbbing mode of operation" is confirmed - see "Fig. #C11" below. Fig. #C11b (right): A night photo of a UFO type K3 flying in a "throbbing" mode of operation. The above photograph (originally in colour) was taken on 2 August 1965 by 14 year old Alan Smith, over Tulsa, Oklahoma, USA - see [1P2] page 241 and [2P2] page 371. In the centre of this UFO, at the outlet from its main propulsor, a layer of ionized air glowing a blue colour is visible. In turn around the vehicle's flange the air ionized by the magnetic field from the side propulsors is glowing a yellow-red colour. The non glowing main body of the UFO remains invisible in darkness. Compare the above photograph with "Fig. #C3b" and also with part (a) of the above illustration. If UFOs utilize the Magnocrafts' principles of operation, their behaviour in space should be described by the laws of magnetism, not by the laws of hydromechanics. We know that the aerodynamic flight of contemporary aeroplanes is controlled by a set of laws of hydromechanics. From these laws the main attributes of present flying machines result, such as: aerodynamic shapes, the existence of various aerodynamic protrusions (wings, rudders, stabilizers) attached to every aircraft, smooth, flowing flights, turning with large radiuses, etc. If we now consider those vehicles whose operation is based on laws of magnetism - not on laws of aerodynamics (e.g. Magnocrafts and UFOs), their attributes must be completely different from those of aircraft. For example, the magnetic vehicles are not required to have aerodynamic shapes and thus may fly with their flat surface (e.g. with a floor) pointed towards the direction of movement. But their shells must fulfil the set of equations which results from laws of magnetism (which are listed in Figure F18 from monograph [1/4]). They will not have any controls or protrusions, as their flight and manoeuvres are achieved by appropriate changes in outputs from the magnetic propulsors hidden inside their shells. Also their behaviour in space will be drastically different from that of contemporary aircraft, because they must obey laws of magnetism. 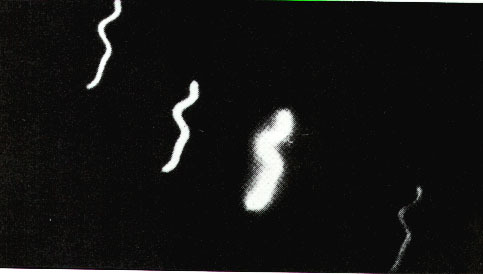 The magnetic character of UFO flights can also be determined from an analysis of shapes that the "ionic picture of a whirl" shows on some photographs. In the photograph from "Fig. #C12a" a formation of flying UFOs is captured. These vehicles' have "ionic pictures of a whirl" which display a very unusual "shoe" shape. We know from the mechanism which forms such ionic pictures that unless special dynamic conditions occur which cause the deformation of these pictures, their shape should be symmetrical towards the vertical axis (refer to item #C7 above). The Italian investigator, Renato Vesco (see [1P2] p. 212) analyzed the dynamic conditions forming the pictures presented in "Fig. #C12a" and he made very interesting discoveries. According to his findings, UFOs need to fly slanted in relation to the direction of their motion in order to produce such a "shoe" shaped ionic picture of their whirls - see "Fig. #C12c". This means that whenever a clash occurs between the magnetic requirement of flying with the base perpendicular to the environmental field's force lines and the aerodynamic requirement of minimal resistance orientation, UFOs always fulfil the magnetic requirement and flu with their basis perpendicular to the Earth's magnetic field force lines. Thus the picture in "Fig. #C12a" presents photographic confirmation for the magnetic character of flights of UFO spaceships. Fig. #C12a (left): One amongst two formations of UFOs taken by Carl R. Hart, Jr. above Lubbock, Texas, USA, on the evening of 31 August 1951 - see [1P2] page 211, [2P2] page 215, and [8P2] page 46. Five pictures were there taken of the two UFO formations flying in two different directions. The above photograph shows the V formation of UFOs flying in a magnetic whirl mode of operation. The "ionic pictures of the vehicles' whirls" take the very unusual shape of "shoes". As it is explained in "Fig. #C12b" of the above illustration, such "shoe shapes" result from the requirement that UFOs must always fly with their base perpendicular to the local course of the force lines of the Earth's magnetic field. Thus this photograph adds significantly to the proof that UFOs obey the laws of magnetic flight. Fig. #C12b (right): The drawings illustrating the deductions by Renato Vesco. They are published in book [1P2] page 212. In 1972, an Italian investigator named Renato Vesco proved that UFOs flying slanted from the least aerodynamic resistance orientation must produce a "shoe shaped" ionic picture of a whirl. His proof supported by the photograph presented in "Fig. #C12a", confirms that UFOs fly in the non aerodynamic magnetic manner that contradicts the laws of hydromechanics. The most vital primary condition which UFOs always fulfil during their flights, is that these vehicles must always be oriented so that their bases (floors) are perpendicular to the force lines of the Earth's magnetic field. When a variety of independent facts combined together into a logical deduction lead to one consistent conclusion, they constitute formal proof. Because the reasoning and evidence from this "part #C" of the web page in fact consistently confirms the main thesis which states that "UFOs are already operational Magnocraft", then starting from this point the truth of this thesis must be recognized as formally proven. This in turn means that the formal proof that "UFOs are already operational Magnocraft" is accomplished. (1) UFOs do exist (i.e. UFOs are material, thus they must exist objectively). (3) UFOs need to be built and controlled by intelligent beings. (4) The civilization(s) sending UFOs must be extraterrestrial, as mankind has not yet developed technology sufficiently sophisticated for the completion of such vehicles. (B) This proof confirms the correctness of the Theory of the Magnocraft. From the point of view of the validity of statements of this theory, the formal proving of the existence of the vehicle, which already utilises the principle of operation that is used in the propulsion system of the Magnocraft constitutes almost an equivalent to presentation of a working prototype of this vehicle of our future. Thus now we can be absolutely certain that the Magnocraft is going to work - if we decide to build it. (C) This proof emphasizes the importance of UFO research. The scientific analysis of UFO observations represents a most vital factor that allows the fast completion of our Magnocraft. Thus the dissemination of significance of UFO observations is a vital component of the accomplishing by our civilisation of a capability for interstellar travel. The methodology of "matching attributes" applied here to prove formally that "UFOs are Magnocraft which are already operational" also provides an additional benefit which should be explained here. Namely, it introduces the extremely important postulate of interchangeability between UFOs and the Magnocraft. According to this postulate every correct equation, principle and fact established for the Magnocraft must also apply to UFOs; as well, every fact observed on UFOs must apply to the Magnocraft. The practical utilization of this postulate on one hand allows for faster progress in the building of our Magnocrafts, through utilizing technical solutions that have already been observed on UFOs. On the other hand it allows for the more rapid unveiling of the UFOs' secrets by applying to them all the findings concerning the Magnocrafts. One of the most vital consequences of this postulate to the content of this monograph is that Table F1 in monograph [1/4] contains also complete design data for all eight types of discoidal UFOs (i.e. not just only design data for subsequent types of Magnocrafts), while all descriptions from chapter F of monograph [1/4] (as well as illustrations for that chapter F) with the same precision illustrate UFOs as they present Magnocrafts. Thus, if we wish to learn more technical details about any type of UFOs, it is enough to look into this Table F1 in monograph [1/4], or to review appropriate fragments of chapter F of monograph [1/4]. Also all mathematical equations, logical deductions, and descriptions provided in monograph [1/4] for the Magnocrafts, must be fulfilled in relation to UFOs as well. A historic resolution was accepted on 24 March 2003. Because it directly relates to the parasitic creatures currently called UFOnauts, which by religions are called "devils", "fallen angels", or "hordes of Satan", I am going to present it here. The painful and prolonged fate of this resolution is described more comprehensively in subsection A4 of monograph [1/4]. The voting on this resolution was carried out in very dramatic circumstances, under a significant external pressures, and with intensive sabotage of UFOnauts. During this voting UFOnauts demonstrated to the participants of the internet list the power of their occupational forces, and their control over the development of situation. However, although this resolution turned out to be a painful and expensive victory of totalizm, still it is a victory, and this is what matters the most. Here is the content of this resolution. We, 161 participants of the internet list [email protected], representing almost every area of life and almost every region of Poland, with a great concern observe the development of present situation regarding parasitic activities of UFOs on Earth. From one side we see the passivity of authorities and adverse of scientists towards increasingly larger problems that are induced by parasitic activities of UFOs on Earth, and we also see the growing tendency to ignore the prevailing collective opinions of majority of people and to base UFO-related decisions on claims just a few non-constructive individuals. On the other hand we notice the overwhelming accumulation of evidence on the continuous presence of UFOs on Earth, evidence of immoral interference of UFOnauts in our public life, and evidence of abductions of people to UFOs combined with biological exploitation of people in UFOs. We are also aware, that in 1981, in the Polish Journal Przeglad Techniczny Innowacje (no 13/1981, pages 21-23) for the first time a formal scientific proof was published, which stated that "UFOs are Magnocraft". Starting from that moment, a growing number of scientific monographs is widely available for all interested, which formally prove the physical nature of UFOs, the parasitic interests of UFOnauts in Earth, the magnetic character of UFO propulsion systems, etc. Until present day these formal proofs transformed the knowledge on UFOs that is available so-far into a single consistent logical structure, proving via this structure that (1) UFOs do exist and they are material space vehicles piloted by morally degenerated relatives of people that originate from space, (2) that morally decadent owners of UFO vehicles occupy and exploit humanity in a hidden manner, and (3) that the design and operation of the space vehicle with magnetic propulsion called the "Magnocraft" provides a complete and correct explanation for all technical aspects of UFOs. We are also aware, that very detailed descriptions of the Magnocraft, as well as all scientific proofs that originate from Magnocraft, are available in a number of scientific publications. Amongst these publications the most up-to-date is the scientific monograph [1/5] by Prof. dr Jan Pajak, entitled "Advanced magnetic devices" (5th edition, Wellington, New Zealand, 2007, ISBN 0-9583727-5-6). This monograph is distributed free of charge from numerous totaliztic web sites listed in "Menu 2", for example from the site named text_1_5.htm, or (for slightly older version of it) the site text_1_4.htm, or on several others indicated by links from these sites. While being aware of all the above, and simultaneously knowing about responsibility that lies on our shoulders because of our representation of the cross-section of the entire society and all regions of our country, herewith we resolve the following. #1. We resolve that we officially recognise the formal proof that states that "UFO vehicles do exist". We know that this proof, carried out according to the scientific methodology of "matching attributes", is published and distributed constantly starting since 1981, and that no-one managed to undermine the merit of it. By recognising the significance and validity of this scientific proof, we simultaneously declare and remind, that it has the binding power and that its conclusions, and awareness consequences, should be considered in action of every person on Earth. Especially binding this formal proof is for scientists and for UFO investigators, who on the basis of it have the obligation to undertake the constructive research of goals and manifestations of UFO activities on Earth. #2. We resolve also, that we officially recognise merit of the formal scientific proof stating that "UFOs are Magnocraft, which are constructed by technically highly advanced, although morally decadent, civilizations of evil parasites from space". We oblige everyone to respect the conclusions and significant consequences of this proof. #3. Furthermore we resolve, that we officially recognise the formal scientific proof, that "morally decadent owners of UFO vehicles occupy our planet in a hidden manner, and secretly carry out a large scale exploitation of humanity". We oblige every citizen of our planet to encompass the seriousness of consequences of this scientific proof, and to initiate actions that gradually neutralise this occupation and exploitation of people by UFOnauts. While resolving all the above, we simultaneously strongly encourage all interested, to urgently learn about scientific proofs contained in the monograph [1/4] indicated above, the official and popular recognition of which this resolution declares and also the multitude of consequences of which we are trying to realise with the assistance of this resolution. We also encourage to learn the design, operation, and propulsion system of the Magnocraft, which is the space vehicle that represents an Earth's version of UFOs (means which displays all attributes of UFOs, carries the same operational capabilities as UFOs, and induces the same phenomena which are known from UFO observations). While issuing this resolution, and granting to it the character of a true representation of our collective views and wishes, we simultaneously hope, that the resolution finally is going to initiate constructive actions and initiatives regarding UFOs, so long-awaited by the society. For example we hope, that it is going to inspire the undertaking of systematic research on UFOs by scientists and by people responsible for our security and our level of informing. We hope, that in all matters regarding UFOs the society starts to draw from collective wisdom and stops following the claims of wrong but noisy individuals, who probably are manipulated by these parasitic UFOs. We hope, that this resolution breaks through the impasse to-date which surrounded the progress of people's rational understanding of the reasons, multitude, and technology of morally degenerated aggressors from UFOs. We hope, that it is to make people sensitive about immoral, parasitic, and hidden character of all activities of UFOs on Earth. We hope that it points the attention of authorities at burning issues of the defence of society from evil exploitation by UFOs. We hope, that it makes everyone interested in the scar from identification implant of UFOs, which (the scar) the majority of us is having on a leg. We hope, that it is going to initiate more intensive observations of UFO activity in our living space, and that it realises that with appropriate methods and devices which are sensitive at fast telekinetic motion, literally tens of visually invisible, telekinetic UFO vehicles can be registered in our sky in every moment of time (these telekinetic UFO vehicles are usually referred to, as "rods"). We hope also, that this resolution inspires all people to undertake an active self-defence against cosmic aggressors from UFOs. This resolution was taken on 24 March 2003, in the result of anonymous voting (which was based on pseudo-names) that was open for participants of debates on the internet list [email protected] The results of this voting was unanimous - the entire 100% of voting participants gave their votes for accepting this resolution. The participants confirm that the voting had anonymous character, thus the results represent an exact reflection of actual views and wishes of people that voted. In turn because voters represented the cross-section through the entire society and through all regions of Poland, and also because the text of what was resolved represents the collective opinion of voters, this resolution is representative for the stand, wishes, and feelings of significant proportion of citizens of Poland aware of the seriousness of current situation. The above should be complemented with the information, that soon after the above resolution was voted, UFOnauts sabotaged to the destruction the discussion list of totalizm on which this resolution was developed and accepted. Then UFOnauts sabotaged also the next discussion list of totalizm formed on its place. Thus since the first half of 2005, totalizm acts without a discussion list. So the only communication with practitioners of this philosophy are presently emails and also blogs of totalizm available under addresses listed in item #H2 of this web page. Independently from this item and this web page, the resolution discussed here is also published and discussed on several other totaliztic web pages, for example on pages: explain.htm, antichrist.htm, or ufo.htm. Here is the definition for the "type of Magnocrafts" (and UFOs) that I adopted in the monograph [1/4] and in other my publications. Type of Magnocrafts (and UFOs) is a name for the entire group of almost identical vehicles, which share exactly the same values of their basic design parameters, especially their: "K" factor, number “n” of side propulsors, major dimensions such as “d”, “D” and “H”, external shape, and various standardized features subjected to international (or interplanetary) agreements (e.g. the SUB system). Therefore any group of Magnocrafts (and UFOs) belonging to the same type, is able to couple together into homogenous arrangements, independently of who produced these vehicles and when, what is their purpose, etc. All Magnocraft (and UFOs) of the same type must also look identical from the outside, and must have the same number "n" of side propulsors. But they can be subdivided into slightly different internal rooms, may use different materials for their shells, be produced by different countries, companies, or civilisations, be made in different years, serve different purposes, and so on. The external diameters (D) of subsequent types of Magnocrafts and UFOs are aligned according to a binary progression. Due to such their aligning the external diameter "D" of each larger type of the Magnocrafts (and UFOs) is obtained by doubling the diameter of the previous smaller type of this vehicle. Because there is a linear relationship between the outer diameters "D" and some other dimensions and parameters of the Magnocrafts (and UFOs), a number of various dimensions of these vehicles are also aligned in such a binary fashion. For example, the diameters "d" of the circles of vegetation scorched by propulsors of these vehicles in the landing sites of Magnocraft (and UFOs) - see "Fig. #E1" below, must also be dimensioned in such a way that circles from each subsequent type of these vehicles are twice as big as circles produced by the previous type of these vehicles. Fig. 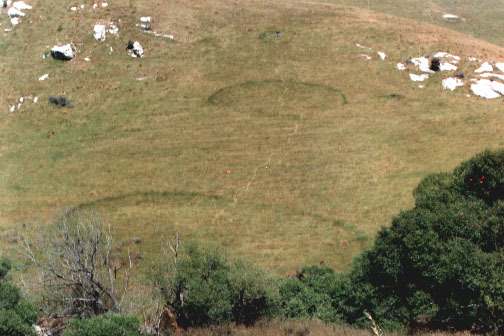 #E1a (left): A photograph of landing sites created in grass by UFOs type K4, K6, and K7. It documents that diameters of UFO landing sites, similarly like landing sites of the Magnocraft, form a mathematical progression with the ratio 2. It was taken by the author (Dr Jan Pajak) in Weka Pass, New Zealand, on the side of State Highway 7, on 3 January 1988. Fig. #E1b (right): Compendium of easy to use methods of identifying the type of Magnocraft (and UFO) through determining its type factor "K". Because all technical details of this spaceship are derived from "K", when this factor is known, the rest of the vehicle's dimensions and parameters can be learned (e.g. from "Table F1" in monograph [1/4]), or calculated from a set of appropriate equations listed in Figure F18 from monograph [1/4]. #1. The method involving proportion of main dimensions. It allows for the direct determination of the vehicle's type factor "K", through measurement of the apparent height "H" of the observed spacecraft (base to top) and then determining how many times this height is contained within the outer diameter "D" of the vehicle's flange (the result of the division K=D/H represents the value of "K" which must take one of the following "integer" numbers: K=3, K=4, K=5, K=6, K=7, K=8, K=9, or K=10). In the above example ("Fig. #E1b") the apparent height "H" is contained three times in the vehicle's apparent diameter "D", thus the illustrated vehicle is type K3 (i.e. its type factor is equal to: K=3). #2. The method involving counting the number "n" of the vehicle's side propulsors. The "K" factor is then determined from the following equation (F9): K=1+n/4 (see also equations F2 and F6, and Figure F28 in monograph [1/4]). #3. The method involving counting the number of the “SUB” lamps. The "K" factor is then determined from the following equation: K=(SUB)/2 + 1. #4. The method involving counting the number "f" of magnetic waves. The "K" factor is then calculated from the equation: K=1+f, where f=n/4 (see also subsection F7.2 and Figures P19D and P29 in monograph [1/4]). #5. The method involving counting the number "crew" of the vehicle's crew members (do not confuse them with passengers). The "K" factor is equal to this number: K=crew (see Table F1 in monograph [1/4]). #6. The method involving measurement of the nominal diameter "d" of the circular marks scorched during landings on the ground by the vehicle's side propulsors. The relationship between this diameter and the “K” factor is (F34): d = (0.5486/sqrt(2))2^K metres (where the symbol "sqrt" means "square root", while the symbol "^" means "the power of") - see equation F34 in monograph [1/4]. Thus knowing "d", the value of "K" can either be calculated from this equation or learned from columns "K" and "d" of Table F1 in monograph [1/4]. #7. The method involving identification of the vehicle's outlines by matching with the shapes of all eight types of Magnocraft (and UFOs) listed in Figure F19 from monograph [1/4] (K is determined through this identification). #8. The method involving identification of characteristic attributes of the vehicle's interior. Data for this method is discussed in subsection F2.5 in monograph [1/4]. In turn an example of its use is provided in subsection P6.1 of monograph [1/4]. It is the undeniable fact that the dissemination of reliable knowledge about UFOs is by someone intentionally blocked on the Earth. In turn the only creatures which can be interested in this blocking are UFOnauts themselves. Reasons for this blocking of the reliable knowledge on UFOs by UFOnauts themselves, are explained comprehensively on the web page evil.htm - about origins of all evil on the Earth. According to press releases, Vatican takes an unambiguous stand towards aliens. This stand is also NOT denying - as is the stand of NASA or governmental agencies of many countries, but a constructive approving stand. Around a half of May 2008 the stand of Vatican was published in a number of articles from New Zealand newspapers, amongst others in the article entitled "Aliens our brothers, Vatican says", from page B2 of New Zealand newspaper "The Dominion Post", issue dated on Thursday, May 15, 2008, or in the article "Alien faith OK, says Vatican", from page A12 of newspaper The New Zealand Herald, issue dated on Thursday, May 15, 2008. Personally I am very impressed by this constructive stand of Vatican in matters of aliens. After all, so-far this is the first institution on the Earth which has the courage to take such an open-minded stand towards aliens. I personally believe that the reason for which Vatican takes so constructive stand in matters of aliens is because from the definition it researches the intelligence other than that of human. Thus it has methods and traditions to treat responsively and correctly such intelligences other than human - means the intelligences which NOT always cooperate with investigators who try to research them. As I explained this extensively in item #B1 of this web page, the lack of competence in research of intelligences other than human is the major reason for which the official human science denies the existence of UFOs and UFOnauts. By some strange "coincidence" in the same newspapers and on the same pages as the constructive and open minded stand of Vatican regarding aliens, was also published the commentary about documents which revealed the stand of the British government. This commentary suggests an inclination to ignore and to dismiss the significance of UFO sightings. Such placing together these two opposite stands, make an impression that someone who controls the views of people, is very interested in decreasing the impact of the official stand of Vatican described above, through a simultaneous adding to it the stand that is ignoring towards UFOs. The stand of the British government in UFO matters was revealed in the article "Flight tower landed UFO", from the same page B2 of the New Zealand newspaper "The Dominion Post", issue dated on Thursday, May 15, 2008, and also the article "Close encounters of absurd kind", from the same page A12 of newspaper The New Zealand Herald, issue dated on Thursday, May 15, 2008. The opportunity to reveal this stand provided the success of British UFO researchers to gain an access to old governmental documents concerning the official UFO research in Great Britain. As it stems from these documents, the British government had to its disposal the sufficient evidence to arrive to conclusions which are exactly the same as conclusions from this web page - namely that "UFOs do exist objectively", and that "UFOs are material flying vehicles". But in spite of this, the government still limited its UFO research to just determining whether these extraterrestrial spaceship are actually of the Russian production. (The documents being released under the "official information act" originated from times of the so-called "cold war".) When it was discovered that UFOs are too advanced to be just Russian spaceship, all interests in UFOs seemed to be extinguished. What even more vital, it appears that the government would NOT even try to check or to determine whether UFOs undertake secretive aggressive actions against the humanity - means actions such as these secretive aggressions that are described on the totaliztic web page katrina.htm - about destructive hurricanes formed technically by UFOnauts hostile towards the humanity. "No proof UFOs exist. WASHINGTON: The US Air Force found no evidence of extra-terrestrials during a 22-year investigation into sightings of unidentified flying objects (UFOs), the Pentagon said yesterday. Code-named Project Blue Book, an air force unit headquartered in Dayton, Ohio checked out 12,618 purported UFO sightings from 1947 to 1969 before abandoning the effort. "We cannot substantiate the existence of UFOs and we are not harboring remains of UFOs," Pentagon spokesman Kenneth Bacon said. - AFP"). To the above it is worth to add, that the date of this release on 1 April 1997 (fools-day), gives to it a "diplomatic" character. Namely, it places the authors of this release in the situation of "sitting at the top of fence with the possibility of them jumping later on either side of this fence". After all, independently of the date of this release, it already did the destruction in the world, as it reassured thousands (if not millions) of people in their denying stand towards UFOs. But simultaneously, it provided the authors of this release with a chance to deny it under the excuse that it was just a "fools-day joke" - if in the future by any chance some undeniable evidence for the existence of UFOs would accidentally emerge (e.g. if one day after a diplomatic gathering in the White House a forgotten UFO vehicle would be left on the lawn). In items #C1 to #C6 from a different web page named telekinetics.htm is defined the new so-called "totaliztic science". It researches the reality that surrounds us from the opposite than the current official science philosophical approach "a priori" - that is the approach "from cause to effects" or "from God understood as a superior cause of everything, to the surrounding reality understood as the effects of continuous actions of this God". (Notice that the current, official science researches everything from the philosophical approach "a posteriori" - means "from effects to causes".) This new "totaliztic science" explains UFO manifestations in a completely different way than UFOs were explained previously. Namely, in 2007, from its research on UFOs arose the conclusion that UFOs and UFOnauts are temporary "simulated" by God and then confronted with carefully selected people, so that in that way UFOs and UFOnauts assist God in accomplishing a whole range of His superior goals. Descriptions of some amongst these superior goals that God accomplishes through temporary "simulation" of UFOs and UFOnauts are presented e.g. in item #C6 from the web page named god_exists.htm, in item #C2 from the web page named tornado.htm, in item #L2 from the web page named magnocraft.htm, and in a few yet another totaliztic web pages. This is how facts regarding formal scientific proof for the existence of UFOs look like. I do hope that these facts confirms extend horizons and the view of world in the reader. It is also worth to check periodically the blog of totalizm available under e.g. address: totalizm.wordpress.com and totalizm.blox.pl/html. (Notice that all these addresses hold the same blog with the same content of messages.) On this blog many matters discussed here are also explained with additional details written as new events unveil before our eyes. Copyrights © 2017 by Dr Jan Pajak. All rights reserved. This web page is a report from outcomes of research of the author - only that is written in a popular language (so that it can be understood by readers with non-scientific orientation). Ideas presented on this web page (and also in other publications by the author) are unique for the author’s research, and thus from the same angle these ideas were NOT presented by any other researcher. As such, this web page presents ideas which are the intellectual property of the author. Therefore, the content of this web page is the subject to the same laws of intellectual ownership as every other scientific publication. Especially the author reserves for himself the credit-rights for the scientific discoveries and inventions described on this web page. Therefore, the author reserves that during repeating any idea presented on this web page (i.e. any theory, principle, deduction, interpretation, device, evidence, proof, etc. ), the repeating person gives a full credit to the author of this web page, through clearly explaining that the author of a given idea and/or research is Dr Jan Pajak, through indicating the internet address of this web page under which this idea was published, and through mentioning the date of most recent update of this web page (i.e. the date indicated below).